Scooters make taking a quick trip to the supermarket, library or friend's house easy and most of all - fun. So, how can you choose the right mobility scooter for you? There are a few things that you will want to consider before you purchase a mobility scooter. Choosing the right mobility scooter will depend heavily upon a number of factors: level of mobility, budget and personal preference. The sooner you determine which scooter is right for you, the sooner you can start enjoying the ride! When choosing a scooter, one of the first things you'll probably take into consideration is the overall design of the scooter. Fortunately, there are plenty of different types of scooters in a wide variety of designs - from fresh and funky, to more streamlined and serious. Are you looking for a mobility scooter that will turn heads while you're riding it? You might enjoy the eye-catching Pretty In Pink Scooter from eWheels. Are you looking for something a little more masculine? The aptly-named Dude Scooter by eWheels is right up your alley. Three Wheel Indoor and Outdoor Scooters: A three wheel scooter is an ideal choice for you if you primarily used your scooter both indoors and outdoors. Three wheels scooters provide users with lots of leg room and have a tight turning radius for sharp corners. Three Wheel Travel Scooters: Three wheel travel scooters are compact and designed to negotiate narrow spaces. Typically designed to be lightweight, a three wheel travel scooter might be the ideal choice for you if you're looking for a mobility scooter to use for outings, vacations, shopping or errands. Three Wheel Heavy Duty Scooters: If you're looking for a mobility scooter specifically built for a larger body frame, then a three wheel heavy duty scooter might be the ideal choice for you. Heavy duty scooters can usually accommodate weight ranges from 300 lbs. and up. They also feature a tight turning radius for easy cornering. Four Wheel Indoor and Outdoor Scooters: A four wheel scooter is the ideal choice for you if you're searching for a scooter with extra stability. These types of scooters provide a smoother ride on even surfaces and can be used outside sans issue. If you're searching for a scooter that is equipped with speed, comfort and a long battery range, then consider investing in one of these scooters. Four Wheel Travel Scooters: If you're searching for a lightweight and compact scooter, you might be interested in a four wheel travel scooter. Ideal for quick trips or for maneuvering around town, these scooters are easy to assemble and are conveniently portable. Four Wheel Heavy Duty Scooters: These types of scooters are the largest of the scooter family, and are designed to be fast, dependable and durable. Many of these scooters can accommodate weight capacities between 350 lbs. to 500 lbs. There are several things that can affect which mobility scooter is the right choice for you. What Is Your Physical Capability? Before you purchase a mobility scooter, reflect upon your current physical capacity. Ask yourself: Are you able to sit upright for long periods of time? If so, then you're a good candidate for a mobility scooter. 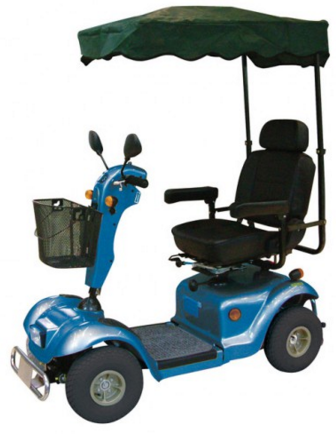 If you have difficulty sitting upright for long periods of time, then you might want to reconsider purchasing a mobility scooter. A scooter requires you to sit upright while using it, so if that is the case. If you have difficulty sitting upright, then a power chair would be a better option for you. How Much Weight Should the Scooter Carry? Figuring out what your required weight capacity for a scooter is will help you narrow down your choices substantially. When looking at different scooters, take into consideration not only your own weight but the accessories that you will also be carrying with you. The combined weight of the accessories and your own personal weight will help you significantly narrow down your options in terms of which scooter is the correct choice for you. Don't choose a scooter with a weight capacity close to yours; instead, choose a scooter in the next capacity range. What Is Your Current Environment Like? If you're searching for a mobility scooter to get around the house, you will need to take into consideration how narrow your hallways or bathrooms are. If you live in a smaller, more compact home, then you might want to consider a three-wheel mobility scooter. If you're going to be taking your scooter outside of the house, then you might want to consider investing in a travel scooter, which usually come apart easily for quick transport. If you're going to be using your scooter outside primarily, then you should look into purchasing a four wheel scooter or perhaps a four wheel heavy duty scooter. Heavy duty scooters have a high weight capacity and larger drive motors, making it an ideal type of scooter for people who require a higher weight capacity and who are going to be taking their scooter on long excursions. If you're going to be using your scooter primarily inside, then your best choice is going to be a three wheeled scooter that will maneuver around small spaces without difficulty. How Will You Store Your Mobility Scooter? If you're going to be transporting your scooter quite a bit, then you will definitely want to choose a scooter that can be quickly assembled and disassembled. Additionally, you will need to check the dimensions of the scooter to make sure that it will fit safely into the back of your car. If you can afford it, it might be ideal for you to have multiple scooters for both home and travel. If you're really unsure about which scooter is ideal for you, talking to your doctor can help. Because there are so many different types of scooters in a variety of different styles, it can be overwhelming to choose one. But with the input from your doctor, you should be able to narrow down which scooter is the correct choice for you. Vitality Medical carries a wide variety of different scooters, including three wheel scooters, four wheel scooters, heavy weight scooters and lightweight scooters. You can visit our mobility scooter page to learn more about the different options available to you.